This year we'll see the first edition of the F18 Raid Worlds. 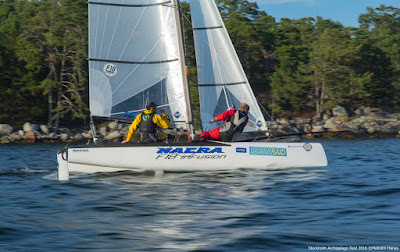 to be held by Lars Linders and the organizers of past years Stockholm Archipelago raid. One of the best regattas on the venue and format. Check great images from last editions at Catsailingnews.com/search/label/Archipelago%20Raid . Note apart for North American F18 sailors check previous post on a mast extrusion batch avaialable at good price. Entries for these Raid Worlds are limited. Details and registration at stockholmarchipelagoraid.com/2017-invitation. The raid will be tough and demanding with 4 intense days of sailing and 2 to 3 legs per day (at least 9 legs planned). A spectacular course out into the wilderness of the archipelago, three base camps on different islands and finish line in the heart of the Capital. A maximum of 50 teams (subject to change). Prices for best teams overall, mixed, female and youth teams. The best team overall wins the title. Meals are included during the race days and there will be sauna and good food and music at all base camps and a final party with dinner after price giving.